Following their association with B-type cyclins, the activation of cyclin-dependent kinases (Cdk) triggers the onset of mitosis. At anaphase after sister chromatids have separated, mitotic Cdks must be inactivated in order for cells to exit from mitosis. During exit from mitosis, cells restore the nucleus to its premitotic state (e.g., disassemble the mitotic spindle) and prepare for cytokinesis (for review, see Morgan ). A prevailing mechanism for mitotic Cdk inactivation is the regulated destruction of mitotic cyclins. Figure 1 Schematic diagram illustrating the structural organization of budding yeast and human Cdc14 phosphatases. The yeast and human Cdc14A and B phosphatase sequences are depicted (accession numbers NP_116684, NP_003663, and NP_003662, respectively) with the total number of amino acid residues shown on the right. The solid black boxes delineate the position of the catalytic domain (~ 330 residues) conserved among all Cdc14 orthologs, whereas the open boxes show divergent non-catalytic regions. The gray boxes depict additional sequences conserved only among the human enzymes and several other vertebrate orthologs. The vertical line denotes the position of the catalytic site; the active site sequence that is identical among all Cdc14 phosphatases is shown underneath (x indicates a variable position). The position of the nuclear export signal (NES) identified in human Cdc14A  is indicated by the triangle. destroyed during mitosis . APCCdc20 acts first to initiate anaphase by ubiquitinating the yeast securin Pdsl. Upon its destruction, Pds1 liberates a protease necessary for sister chromatid separation. Subsequently, Cdhl promotes the APC-mediated ubiquitination of mitotic cyclins and other targets that are destroyed during exit from mitosis. Cdhl is expressed throughout the cell cycle but Cdk-mediated phos-phorylation prevents its interaction with the APC during early mitosis . 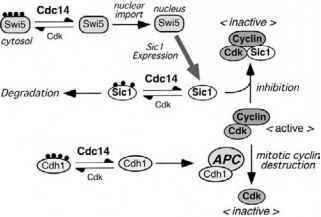 In budding yeast, Cdc14 dephosphorylates at least three substrates (Cdhl, Swi5, and Sicl) [6,7] that ensure the inacti-vation of mitotic Cdk activity through two pathways: degradation of mitotic cyclins and expression of Sic1, a Cdk inhibitor (see Fig. 2). Upon its dephosphorylation by Cdc14, Cdhl activates the APC and directs the ubiquitination of mitotic cyclins and other protein targets . Expression of the Cdk inhibitor Sicl is dependent on the zinc finger transcription factor, Swi5. 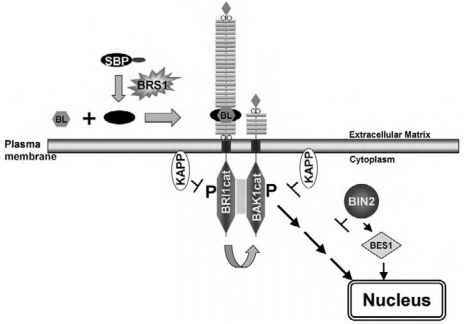 Prior to anaphase, Swi5 accumulates in the cytoplasm but is prevented from entering the nucleus because of Cdk-dependent phosphorylation at Ser residues adjacent to its nuclear localization signal (Fig. 2). Cdc14 dephosphorylates Swi5, thus permitting it to enter the nucleus and activate Sicl transcription . Cdc14 also targets the Sicl protein itself, preventing its destruction as a result of inopportune phosphorylation . Cdhl, Swi5, and Sicl undergo Cdk-dependent phosphorylation, and it is generally assumed that Cdcl4 phosphatases prefer substrates phosphorylated by this group of kinases. Considerable evidence supports this notion, but it is premature to assume that Cdcl4 opposes only Cdks as no sites dephosphorylated by this phosphatase, either in vitro or in vivo, have been directly mapped, and the substrate preference of Cdcl4 has not yet been investigated. Figure 2 The role of budding yeast Cdcl4 in promoting exit from mitosis. The schematic diagram illustrates how Cdcl4 dephosphorylates Swi5, Sicl, and Cdhl to drive Cdkl inactivation by two mechanisms: APC-mediated cyclin destruction and protein inhibition . 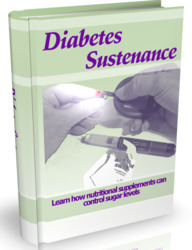 Genetic and biochemical studies have begun to reveal how Cdcl4, which is present at constant levels throughout the cell cycle, is held in check until its activity is required between anaphase and early Gl. Netl (also known as Cfil) [8,9], a major player in the cell-cycle-dependent regulation of Cdcl4, is a core subunit of the nucleolar RENT complex . The RENT complex is also involved in maintenance of nucleolar integrity, repression of recombination among tandem rDNA repeats, recruitment of Pol I, and stimulation of rDNA transcription [l0]. In interphase and early mitosis, most if not all Cdcl4 is sequestered in the nucleolus by Netl [8,9], where its activity is fully inhibited [ll] and its access to substrate is limited. Netl is a highly specific and potent competitive inhibitor (K = 3 nM) that contains a Cdcl4-binding region (residues l-34l) at its N terminus [ll]. Figure 3 A model for the cell-cycle-dependent regulation of Cdc14 by the FEAR and MEN networks. 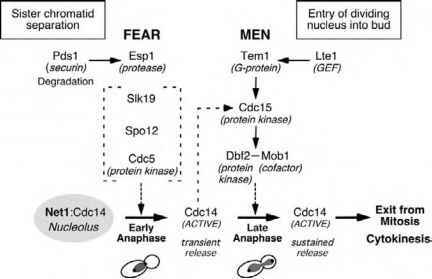 The signaling proteins involved in the FEAR  and MEN  pathways are depicted. Arrows are shown where the order of signaling within the pathways is known. The components (Slk19, Spo12, and Cdc5) enclosed in large brackets are necessary for FEAR signaling, but it is not clear how they interact or in what order they operate in the network. The dashed arrow depicts the potential role of Cdc14 in potentiating MEN signaling by targeting Cdc15 . Although Cdc5 is thought to act in both pathways, it is shown here only in the FEAR network. As indicated by the dashed arrow, the exact mechanism triggering Cdc14 release from Net1 is not known for either pathway. roles during early anaphase. The dependency of Cdc14 release on the proteolysis of Pds1 [19-21] is not explained by the FEAR pathway alone, indicating there must be at least one other mechanism linking the two events. The FEAR and MEN pathways in conjunction with the requirement for Pds1 degradation ensure that mitotic exit does not occur unless sister chromatids are separated and the segregated chromosomes are correctly partitioned to mother and daughter cells (Fig. 3). Like several other proteins of the MEN pathway, the role of Cdc14 may not be limited to mitotic exit but could also include functions required for cytokinesis .